Dodge is one of the oldest automobile brands manufactured in the U.S. Dodge products are available worldwide. Dodge evolved into manufacturing medium sized cars and performance cars in the 1960s and 1970s. Each of the Dodge models was offered with a unique set of details, styling and performance. Each of our Dodge convertible tops is manufactured to original pattern specifications and we offer the original fabric selection. 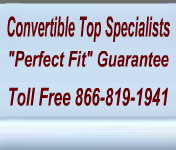 Our Dodge convertible tops will instantly renew your vehicle to show room condition.